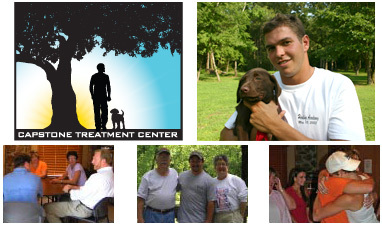 Capstone is a licensed residential treatment program serving troubled young men (14-24) who struggle with chemical dependency, substance abuse, sexual addiction, trauma, family conflict, and personal problems including loss, hurt, anger, abuse, depression, low self-esteem, defiance and a rebellious attitude. Capstone joins with families as they fight for their sons. We seek, along with families, to see these young men develop successful lives, purposes, and relationships. The relationships include self, family, God, friends and grows to wife, children, and humanity. To win this battle, a young man must find his "true self" as described by John Eldredge in Wild at Heart. Addictions, trauma, and other issues keep him from fulfilling his purposes. This sets the stage for Capstone Treatment Center in beginning their healing and recovery journey. Every aspect of Capstone reflects Jesus Christ, but He is never forced on anyone. Capstone is not affiliated with a specific church but instead, just simple Christianity. The goal is spiritual growth toward a personal relationship with God through Jesus Christ, not religiosity. We accept residents where they are in their beliefs, from atheist to devout Christian, and cultivate spiritual growth through truths that will stand on their own including honesty, purity, humility, self-control and more. These Biblical truths are common beliefs to all Christian oriented people. Based on our Christ-Centered foundation, we believe that God has given each young man special gifts and purposes that can be developed and used for good. It is in the process of this struggle that God gives him the opportunity to achieve this growth. Please visit our web site or call us at (866) 729-4479 for more information.